Learn to make savory cookies. These are cookies with minute amounts of sugar or almost none. This is a fully hands on class, please be prepared to work. Learn to prepare these cookies with ginger infusion. This is a fully hands on session, please be prepared to work. A favorite of every festive in Malaysia. Learn to make two types of pineapple tarts. Learn to make Boiled Fruit Cake from Scratch. Please note, Boiled Fruit Cake is baked after the boiling process. This whole 1.7 kilo cake only contains 3 Tablespoons of Sugar. Alcohol will be used unless otherwise stated. Learn to Prepare Roast Chicken, the easiest and least messy and all its accompaniments. Each person will take home a thigh and drumtick. 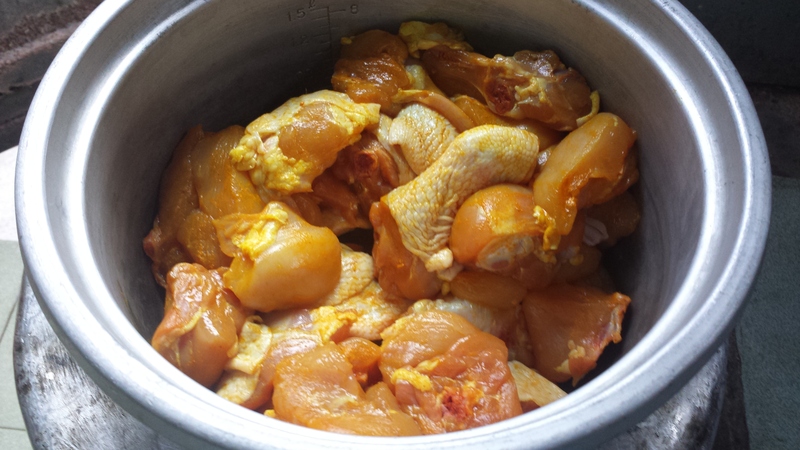 We will be using chicken to make this delicacy. Please be prepared to work in front of the BBQ. It is always easier to eat portioned size cake, especially cheesecake. Here are three of my favorite cheesecakes. More classes will be uploaded this week. Please whatsapp 0166827465 to book your classes. All classes are held in PJ section 14. About six or seven years ago I took the train into KL and for some reason I got down at Sentral and took a Taxi to go further into KL… Till this day I cannot think why but I did it, probably to meet a friend from Australia or perhaps the Netherlands. I cannot seem to remember. So I got into this taxi with an old Indian driver and he started talking to me. I am talkative in taxis, I hate being quiet all through the journey to my destination be it a long or short one gazing into my phone or something like that. This man was in his 70s, I know he was much older then my father. He asked me what I did, so I told him and he was quite excited and gave me this recipe. His mother used to cook it when he was a kid and his late wife would make it for him and his children who were now working in big places and seldom had time for him. That is why he drove a taxi to rid his boredom. 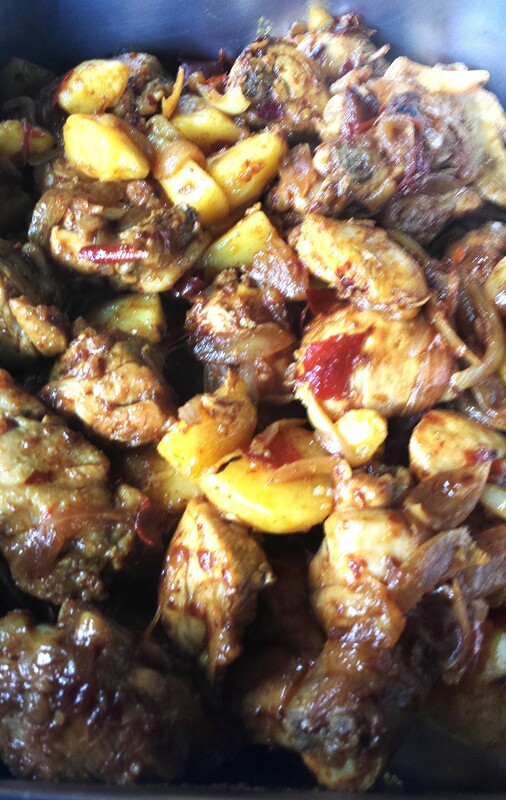 This recipe had only Five ingredients; Chicken pieces, a bowl of cut onions, a bowl of dried chillies, some oil and a bit of salt. I of course argued it might be rather insipid and boring, but he assured me it would be really nice. He missed it he told me and he gave me this recipe so I will try it. Of course it was not a difficult recipe to remember as he did drum it into my head a few times to make sure I didn’t forget. I got out of the taxi and promised I would try this recipe and he assured me I would be happy. Well it took me all this time to actually get a chook and the rest of the ingredients but I never forgot the recipe of course. Yesterday I cooked it for the Assunta Nuns as they have no cook at the moment. So here goes. Please note, I added a bit of turmeric just to give it some color, which was quite unnecessary. Chicken about 1.8 to 2 kilos – cut into 24 pieces. You may cut it smaller but I detest having to go through small bones. 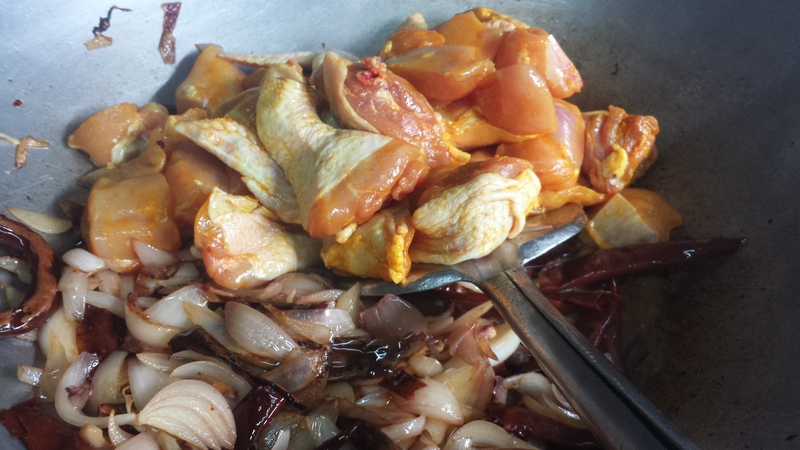 Marinade the chicken with a little salt and ½ teaspoon of Turmeric. Potatoes 3 or 4 – I added this just because I like potatoes. 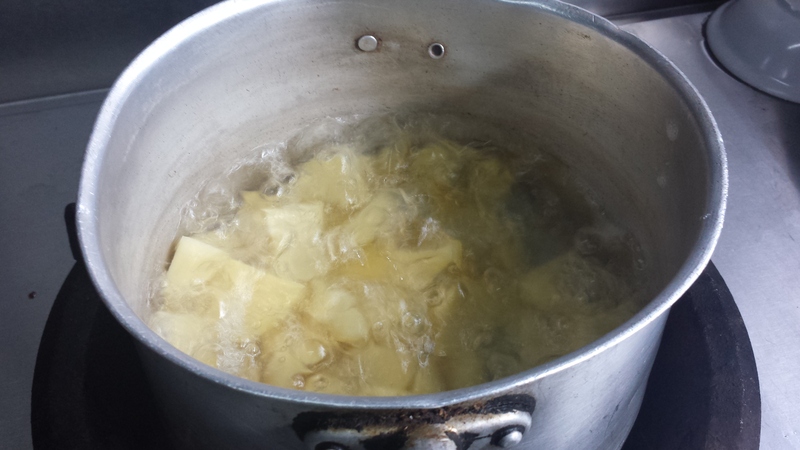 Boil till done. 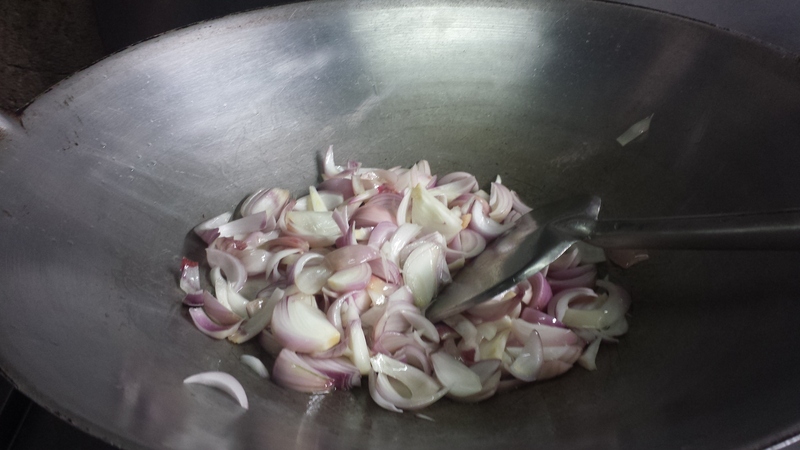 Heat Oil and add in onions. Fry the onions till they are slightly translucent. 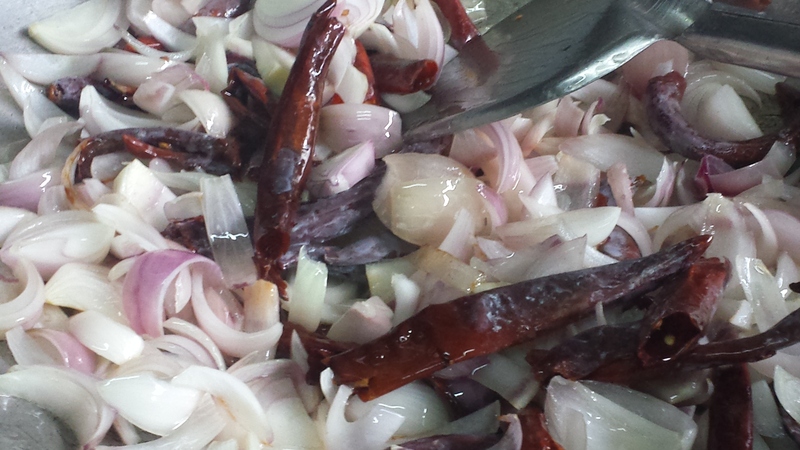 Add in the dried chillies and fry till the onions are really done. This will ensure the Chillies have enough time to let out its flavor. 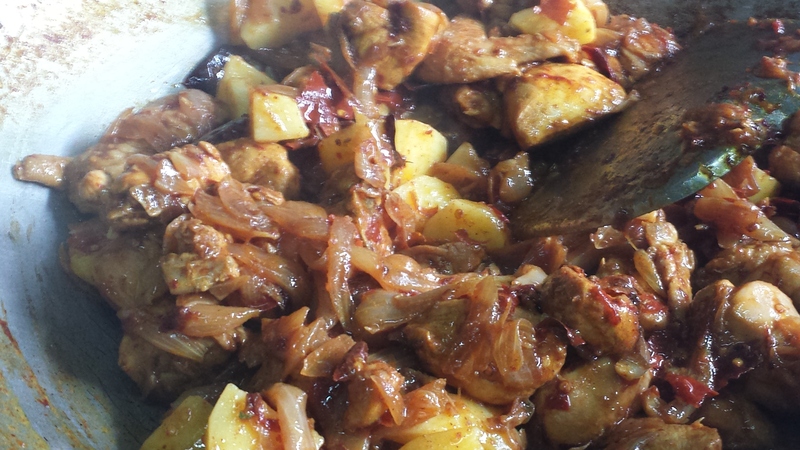 Add in the chicken and stir till it is cooked. You might need to add in a bit of water if it is too dry. Fire has to be medium steady. Fry till chicken is cooked and add in salt. This took me about 30 minutes or so. Add in potatoes and cooked for about 10 more minutes. I was quite shocked with the end result. It was really nice. Simple and delicious. 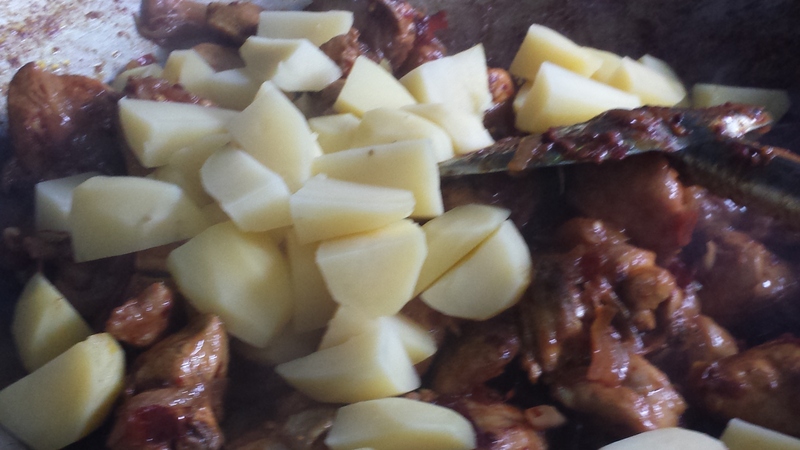 Yus reckoned the potatoes should be fried. I think she might be right because it somehow didn’t look so nice. My walking encyclopedia Susheela says it is called Uppu Chicken Paratel. Uppu meaning Salt. This dish actually goes well with beer and liquor I am told. I will be cooking this dish for 120 people next month. Let’s see how they handle this. So there you go. If you walk in the footsteps of a stranger, you’ll find thing you never knew you never knew..Pocahontas sang that!